Actors perform in “The Play That Goes Wrong.” Alums Jacqueline Jarrold and Ned Noyes are both starring in the national tour, which will be heading to Chicago’s Oriental Theatre from December 4 to December 16. From falling props, forgotten lines and a dead corpse that can’t seem to stay dead, “The Play That Goes Wrong” is anything but a traditional play. “It’s sort of like if Monty Python and Sherlock Holmes had a baby,” Jacqueline Jarrold (Communication ’11) said, an understudy for both of the female characters in the show. 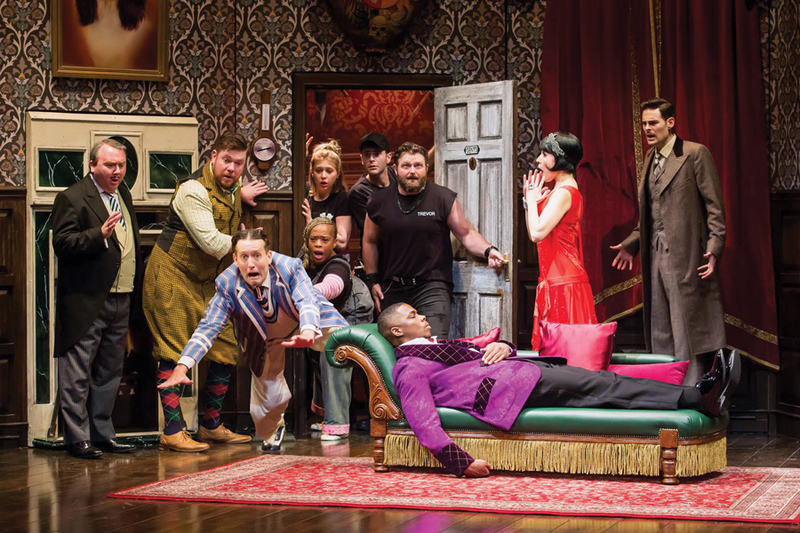 Jarrold is a part of the first national tour of “The Play That Goes Wrong,” which began its trek to 20 cities across the United States on Sept. 18. The show will be in Chicago at the Oriental Theatre from Dec. 4 to Dec. 16. “The Play That Goes Wrong” focuses on the Cornley University Drama Society, an ameteur theater group that sets out to perform a murder mystery, “The Murder at Haversham Manor.” The show documents the characters attempting to finish the play with an ounce of dignity as everything unravels. Ned Noyes (Communication ’00) plays Max, an actor who has never been in a play before. He quickly falls in love with the audience and continues to acknowledge them throughout the evening, Noyes said, much to everybody’s frustration on-stage. Along with a character who breaks the fourth wall, there is also fighting on-stage between characters and collapsing floors. Jarrold and Noyes both say they love the unique and unconventional style. It’s a chance for them to break all the rules actors are supposed to obey, Noyes said. “I have a lovely relationship with the audience every night in a way that you’re never afforded the opportunity to as an actor,” Noyes said. Jarrold agreed, saying there is a sense of community and shared experience between her and the audience that she can’t find anywhere else. She also said traveling the country to make people laugh is a real privilege. Jarrold and Noyes both said they valued their experience at Northwestern and attribute their success to what they learned during their time at school. They both said their professors prepared them well for their careers, with Noyes specifically citing famed professor David Downs. Noyes said he never thought he would be doing such a physically intense show, but said the education was something he felt students at other universities did not get. Jarrold said she also thinks Northwestern is a great place to learn theater because of the number of student theater groups that put on shows every quarter.